Eleodor Sotropa knows first-hand the challenges that talented immigrants face when trying to join the U.S. workforce. 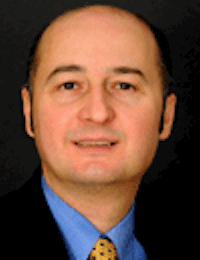 His journey from Romania to Procter & Gamble, where he serves as associate director of Global Business Services, traces a figurative road map that thousands of new Cincinnatians have followed. He did so at the Cyprus International Institute of Management, where he studied with professors from the U.S. and England. Sotropa says he decided to move to Canada after Romania elected “the wrong president,” and he worked for an advertising agency there before hiring on with P&G and eventually moving to Cincinnati. He became a U.S. citizen more than a decade ago. Sotropa is helping make the career journey less arduous for fellow immigrants by serving with CinciGlobal, a workforce initiative promoting engagement, internships and co-op opportunities for international students in order to retain more of them in Cincinnati after they graduate. It’s one of several successful programs introduced by the Cincinnati USA Regional Chamber’s Diverse by Design™ initiative to attract, develop and retain diverse, high-potential talent and move Greater Cincinnati and Northern Kentucky toward full inclusion. Mary Stagaman is the Chamber’s senior inclusion advisor who’s responsible for Diverse by Design and keeping an eye on the various programs and initiatives aimed at increasing and supporting the region’s diverse populations. Diverse by Design was based on evidence that diversity and inclusion are bottom-line imperatives embraced by successful businesses and regions. In other words, increasing diversity and growing inclusion isn’t just the right thing to do but the smart thing. The report was informed by more than 1,600 people who participated in surveys or focus groups to gauge their perception. Strategies for action were developed from insights gleaned from the research. Diverse by Design has been supported by The Greater Cincinnati Foundation’s Collective Impact approach, which addresses issues and concerns beyond the means of any one organization in Cincinnati and Northern Kentucky. Numerous local organizations collaborate around a common vision and unify efforts through “backbone” entities that are championed and shaped with five years of funding from and helpful guidance by the Foundation. Participants adopt measurable goals and work to reinforce one another’s contributions. In a series of special reports, Soapbox has explored how Collective Impact initiatives support social sectors including workforce development, environmental sustainability and education. This final installment digs into one more set of issues at the heart of sustaining Cincinnati as a competitive urban area for economic success: diversity and inclusion. The impact of Diverse by Design as a Collective Impact effort is increasingly apparent, and its success proves that sustained collaboration yields impressive results. The Center for New Cincinnatians will come to life online in November. CONNECT, an initiative bringing together affinity groups at area employers, is poised for rapid growth in 2017. CinciGlobal and other similar initiatives are also making an impact. “New Cincinnatians” are immigrants and internationals who started life elsewhere, perhaps Europe, Africa, Asia or Central America. They currently constitute just 4 percent of our local population, but they contribute significantly to our regional economy with an annual spending power of $1.5 billion. Immigrants made up 12 percent of Greater Cincinnati’s population growth between 2007 and 2012. They’re two to four times more likely than native-born citizens to start a business, and many are well educated, with 23 percent holding advanced degrees compared to 11 percent of people born locally. 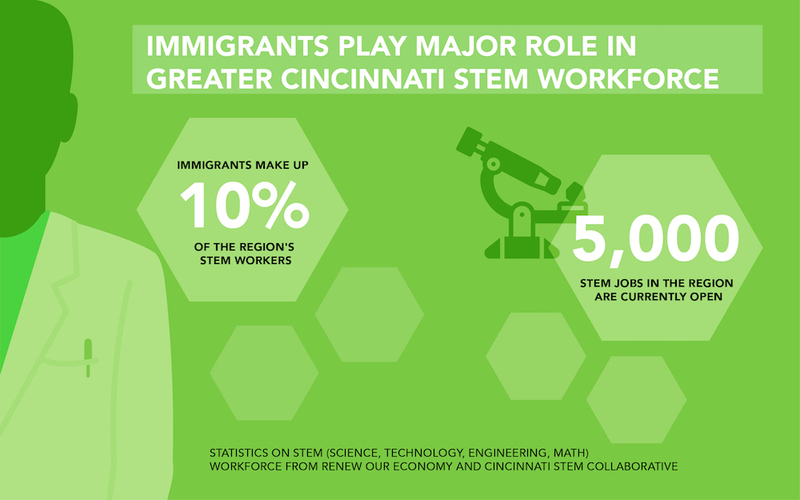 In Greater Cincinnati, they already constitute 10 percent of STEM workers, prepared for employment in the fields of science, technology, engineering and mathematics. They’re a resource with tremendous potential for local growth: In the 2000 U.S. Census, about a quarter of all STEM workers in America were immigrants with college degrees or higher; about half of them held doctorate degrees. Dayton's emphasis on attracting immigrants has yielded significant population growth. If the city of Cincinnati had attracted comparable numbers between 2007 and 2012, the population would have grown by nearly 10,000; instead Cincinnati shrank by nearly 4,500. Considering such potential, Mayor John Cranley convened a task force in 2014 to study how Cincinnati might become a more welcoming place for immigrants. A key recommendation from the task force late last year was to establish a Center for New Cincinnatians to facilitate the entry of immigrants, refugees and internationals into our region. The Cincinnati USA Regional Chamber was recruited to oversee the planning process, building partnerships with existing organizations serving immigrants and recruiting volunteers from multiple sectors who established priorities for the center. The process is another good example of Collective Impact at work. Bryan Wright, manager of international student affairs at Cincinnati State, was involved in the immigration task force, serving on a sub-team focused on education chaired by former University of Cincinnati President Santa Ono and immigration attorney Douglas Haupert. 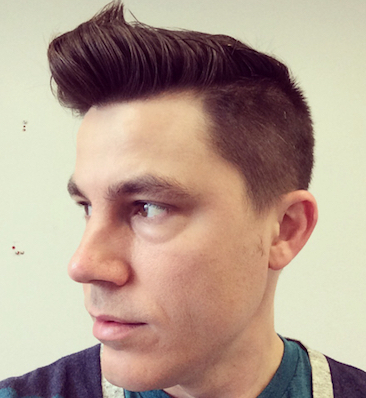 Wright was already involved in similar conversations with Diverse by Design since its early days. They invited the community to decide how the center should function. The Center’s new online portal — the first “proof of concept” — will be introduced and celebrated in a Nov. 1 event at the Chamber. This virtual hub of resources for immigrants is the first step in an array of strategies that will make the region a magnet for talent from around the globe. New Cincinnatians include international students, as many as 7,500 enrolled at area colleges and universities. They’re the focus of CinciGlobal, which has staged two International student career rairs, the most recent hosting 800 international students to interact with employers and international chambers of commerce. The next event is scheduled for March 2017. CinciGlobal is seeking to build on its online hub as a medium to connect university admissions officers, employers and international students and publicize events as well as volunteer and mentorship opportunities. The confusing system for obtaining H1B visas doesn’t help. In order for a foreign-born student to be hired legally in Cincinnati, the job must require at least a bachelor’s degree, be directly related to the degree or field of work that qualifies the student for the H1B visa program and offer a salary that meets or exceeds the visa program’s mandatory level. Not every company is eligible to hire people with these visas — employers must meet various immigration laws and regulations to be eligible. Those could be hurdles that employers might feel they’d rather avoid, Sotropa says. He and professionals from local universities coach students to better navigate this process and educate employers on how to engage these students meaningfully and legally in internship programs. Robert Jones of GE Aviation (center) leads a CONNECT discussion convened by Diverse by Design. Another Diverse by Design initiative, CONNECT, reaches out broadly to strengthen a culture of inclusion. It connects employee resource groups (generally called ERGs) that attract, grow and retain diverse talent at area companies and nonprofits. Early ERGs were focused on supporting the advancement of women or employees of color, but today they’ve multiplied to support Hispanic/Latino, LGBT individuals, people with disabilities, veterans and others. CONNECT has assisted such groups with three core objectives. As its name implies, it first links ERGs from various companies to one another, cross-pollinating inclusion, professional development, community service and social and cultural connections. Second, it helps organizations share best practices, develop initiatives fostering inclusion and capitalize on the power of diversity. Third, it supports communication, promoting Greater Cincinnati’s personal and professional opportunities and high quality of life while simultaneously sharing the importance of inclusion. 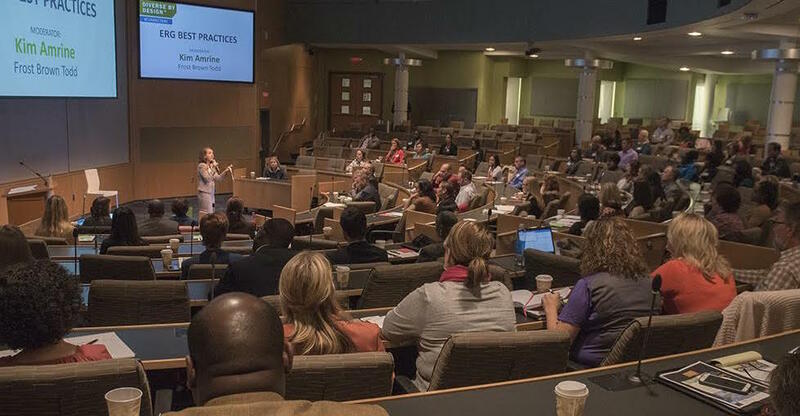 Nearly 60 companies participate in CONNECT, ranging from the region’s largest employers such as Procter & Gamble and Kroger to universities, healthcare, banks, law firms and nonprofits. The concept for CONNECT was developed by volunteers following the 2012 release of the Diverse by Design research report. CONNECT is co-chaired by Randall Stokes of GE Aviation and Lauren LaCerda Merten of Social Venture Partners. The organization’s recent events included an ERG Leaders Forum and an “All-ERG” members event. 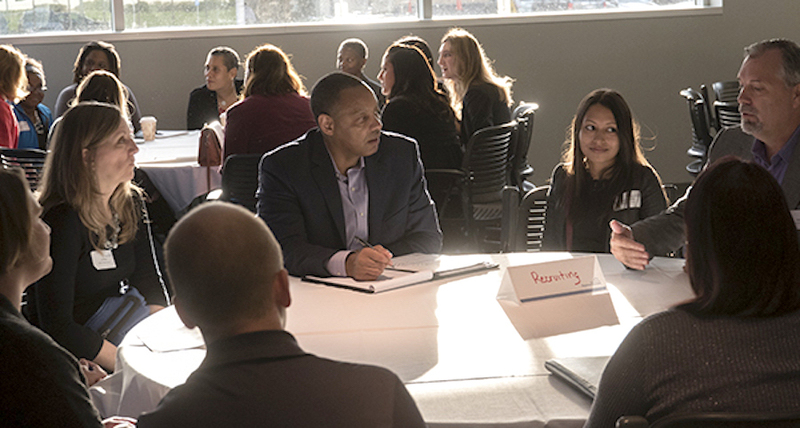 CONNECT also offered a successful “mentorship cafe,” an informal gathering for people to come and ask questions of others with more experience in building successful ERGs. 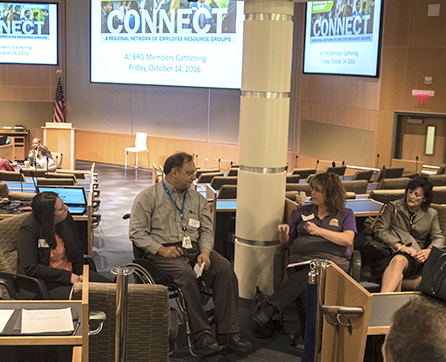 A CONNECT event at GE Aviation brings together corporate leaders to discuss improving workplace inclusion. This month CONNECT released a powerful new toolkit for building strong ERGs, developed by professionals from Cincinnati Children’s Hospital Medical Center, Duke Energy, Fifth Third Bank, Fidelity, Nielsen, Macy’s, GE Aviation and Kroger, replete with information about best practices from across the region. Michael Moore, co-leader of Nielsen’s Pride, an LGBT ERG, says, “I’ve met Employee Resource Group leads from across the Greater Cincinnati area that I might not have otherwise. Leaders from healthcare, energy, colleges, retail, consumer package goods and volunteer organizations all come together to discuss ways to attract and retain talent. This collaborative activity praised by Moore and Shaffer underscores the results possible with Collective Impact. The common agenda driven by Diverse by Design’s role is being advanced by an army of organizations that have agreed on shared measurements and mutually reinforcing activities, succeeding thanks to effective communication and mutual support. Cultural Competence: A learning program focused on building cultural competence in leaders to impact the entire community. Insights in Inclusion: Presents periodic programs on specific topics such as a recent presentation featuring NPR correspondent Shankar Vedantam on unconscious bias. Another program focused on integrating people with disabilities in the workplace. Military Consortium: A hiring initiative involving more than 25 local companies strategically hiring U.S. veterans. Getting Down to Business: A pilot program, sponsored by the U.S. Department of Labor’s Office of Disability Employment Policy, to help small business integrate people with disabilities into their workforce. Learn more about Collective Impact at the Greater Cincinnati Foundation website’s Collective Impact area. See how big, complex problems require a collective approach with a shared vision and goals and all hands on deck rowing in the same direction. Fifth Third Bank’s Diversity Leadership Symposium: An annual program presenting inspirational business leaders and entrepreneurs who represent the best in intentional inclusion. The 2016 Diversity Leadership Symposium is Nov. 15 at the Hyatt Regency Cincinnati, and the keynote speaker will be New York Times columnist and author Anand Giridharadas on “The Future of Leading.” Register here. Diverse by Design has a second statement as part of its identity: Inclusive by Intention. That’s another theme rooted in The Greater Cincinnati Foundation’s Collective Impact initiatives. This is Part 5 of a Soapbox series of reports exploring how Collective Impact is changing and improving Greater Cincinnati. Support for this series is provided by The Greater Cincinnati Foundation. Infographic by Steph Landry Design. CONNECT meeting photos by Scott Beseler. Before Mary Stagaman assumed her new role as Senior Inclusion Advisor with the Cincinnati USA Regional Chamber in March 2016, she led Agenda 360, an initiative that included a focus on attracting more talent to the region. That goal is now supported by the entire Chamber. Diverse by Design's Collective Impact approach has been supported by The Greater Cincinnati Foundation for the past five years. In 2015, Stagaman received the Merlin G. Pope Diversity Leadership Award from the Cincinnati Human Relations Commission in recognition of her role in Diverse by Design. Soapbox: How did diversity and inclusion come to the fore? What came after that “aha” moment? MS: A year’s worth of work. We did a deep study that included Census and other government data for Cincinnati and competitive regions. We conducted expert interviews and quantitative and qualitative research with hundreds of people about their experiences here in our region. Our 2012 Diverse by Design: Meeting the Talent Challenge in a Global Economy report (read here) was an executive summary of the insights we gained about how people felt about the true state of diversity in the region and how they measured the degree of inclusion. How did The Greater Cincinnati Foundation’s Collective Impact approach impact this effort? MS: Agenda 360 was a Foundation “backbone” organization that encompassed Diverse by Design. As with the best Collective Impact initiatives, we developed a clear agenda, collaborative and mutually reinforcing activities and consistent measurement to track our progress and success. To execute on the promise of Diverse by Design, it was imperative for us to be the convener of many companies and organizations to work against our objectives. The day we released our report in 2012, 200 volunteers signed up on the spot; by the end of the second year, we had 400. Where is Diverse by Design headed? MS: We continue to bring people and companies together to support a common agenda. It’s paying off. For instance, with CONNECT, we have companies leveraging the power of affinity networks within their own organizations and bringing those networks together. This promotes retention of top regional talent because employees make vital connections that anchor them here. There’s so much momentum now and so many Chamber members have stepped into leadership roles that our job is to be the touchstone, provide a home base and empower people who share our vision and see the potential. What’s the biggest challenge ahead? MS: To become a highly inclusive community we have to tie it back to issues of equity — the level of disparity in our community between black and white, between people with education and without, between people with money and without. That’s become a focus for many of us. It’s not an impossible task, but it’s very difficult. We need only listen to the discourse in this country right now to know the scope of the challenge. The good news is that here in Cincinnati many voices are saying we will be a more competitive and stronger if we reduce poverty and increase opportunity for everyone. I think of The Women’s Fund of The Greater Cincinnati Foundation, the Urban League, the Poverty Collaborative, the Preschool Promise. It makes me optimistic about our ability as a community to grow our population in a way that looks like where the country is going rather than where it has been and to help everyone reach their full potential. This is hard work, but it’s not a chore — it’s actually a joyful and fulfilling enterprise.